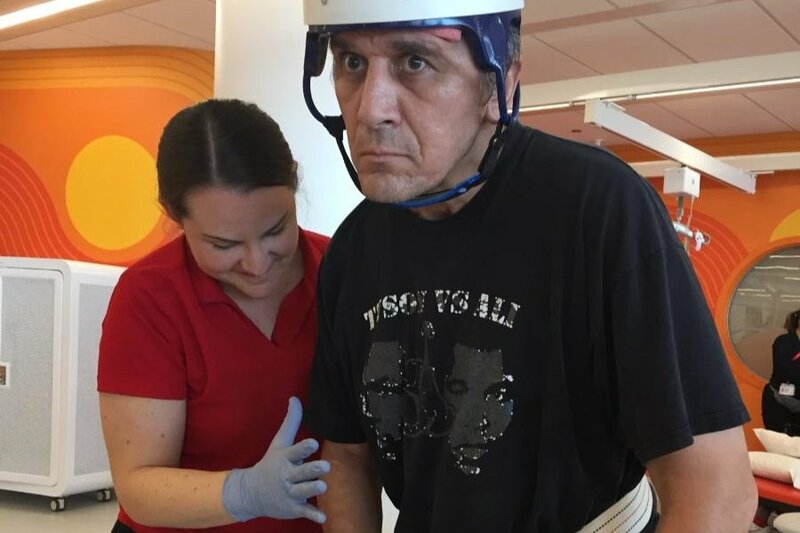 One year ago (8/16/2017), Ed "Iron Man" Gutierrez suffered from a massive stroke while on vacation back home in Chicago. One year later (8/16/2018) Ed has shown DETERMINATION to progress and perform as best as he is able - A MESSAGE HE RELAYED TO ALL THOSE HE TRAINED. The road to recovery has been one day at a time, BUT through the generosity of Ed's friends and family it has made the road a little more manageable during this critical juncture of his life. The funds will continue to go directly to cover extensive therapy services. The staff at the current Nursing & Rehab Facility are in awe of the TREMENDOUS amount of support Ed has in his corner!! Your love, care, and consideration have gone a long way in helping our friend and brother find the strength to recover. On behalf of Ed... THANK YOU!! Please continue to share this campaign with your friends, family and loved ones! To all generous Family/Friends of Eddie living in Illinois, California, New Jersey, New York, Colorado, and the rest of the “United States kin”. The long week is over and I am sitting in B128 looking at Ed. “I’m just going to change your collar, Ed”, says Lori, the Respiratory Care Practitioner. I (Nick) have been here for about 4 hours and she has been very attentive to Ed. She has given him breathing treatments, she consistently cleaned the phlegm, and “changed his collar”. I learned they are weaning him off his trach tube. His trach tube has been changed from an 8-inch diameter tube to a 6-inch diameter tube. According to Lori, the more air that goes around the tube in the trachea indicates the progress Eddie’s body is making to breathe “normally”. Another very interesting thing – Eddie sat in a chair. I finally saw Eddie wearing his helmet. (It was good to see written on the dry erase board “Helmet when out of Bed!”) I was told by Eryn, the assigned RN, getting him out of bed and into a seated position helps with circulation, helps him to breathe more easily, and other beneficial factors. So he sat in the big metal reclining chair for about two hours. AND Maureen (a wonderful person of Eddie’s who made the chocolate chips cookies sitting in the green container in Ed’s room) and I witnessed Eddie moving his left arm. I wouldn’t say they were “purposeful” movements but he moved it back and forth a couple times. Unfortunately, he made these movements while sleeping but it was something more than usual. Oh. Almost forget. Those of you who visit, I added some color to the room. I hung up the get-well cards. I posted on the wall the large, beautifully-colored signs done by Keith’s little girls: “Iron Man. Feel Beter.” (I know it is mis-spelled but it is so cute that Abby made it for Eddie, regardless.) I asked Sammi, the Patient Care Technician, about bring in the 2 balloons Eddie received from his 2 nephews while at Christ Hospital. She said it is “ok” as long as they don’t get in the way. I think we will hold off on the balloons. Before I left for the evening, I left the air conditioner on in the room. I left a tennis match playing on the tv with the hand-held speaker next to Ed’s left ear. And I left wondering about …. Oh never mind. It’s been a long week. PLEASE continue to share this GoFundMe campaign as far as it will reach in all corners of the nation. Those of you who have generously provided to Ed – you are amazing!! To all generous people who have been able to add to Ed's GoFundMe Campaign... thank you. I am Eddie's brother, Nick, and Ed's entire family cannot thank you enough. It is humble to be connected to each other in some extraordinary way - through Eddie. All I am able to do on behalf of Eddie at this time is to offer an "update" on his progress. I posted a couple updates on this GoFundMe page, but if you are on Facebook, please send me a friend request and I will add you to the FAMILY group where you will see more frequent updates of IRON MAN. He could always use more love, support, & prayers. And if you are able to visit him in the hospital, please do!! Ed is off the ventilator and breathing more steadily on his own. Visitors report he opened his eyes and was looking around. These instances were brief but a good sign that the brain stem is not stressed. He seems to be responding to some of the bodily assessments done by the nurses such as his pupils reacting as they should to light. Both sides of his body are responsive to pain stimuli – a good sign. There is no purposeful movement of the left side of the body yet. Ed continues to be fed through the feeding tube and his body seems to be absorbing the nutrients. They continue to monitor his blood sugar AND they have not had to give him a shot of insulin today (8/31/17). He continues to be given “a shot of blood thinner” versus “the drip”. The CT scan from this morning (8/31/17) shows the brain as “unchanged”. There is no swelling but not showing a significant decrease in swelling since the 2nd surgery either. But, understandably, it is still too soon to expect a noticeable change from one CT scan in comparison to a following day’s CT scan. Every now and then Ed tends to get hiccups. I heard different reasons for this and I still don’t understand each of the reasons. I know they are giving him something in order for his body to better manage them. They told me the name of the medicine, but I don’t remember. As I mentioned at one time, all this medical jargon tends to go over my head. I could try to retain the exact name or the exact purpose what the medicine is addressing and stick it in an “update”, but it will be too overwhelming for me. On a personal note, I took some time to read responses to my updates. I also read comments stated on the GoFundMe page. If/when Eddie is given the opportunity to speak, I can’t help but wonder Eddie’s first words or even his initial reaction to the outpouring of compassion and support. Each of you has been drawn to him, but what stood out the most? Please share a brief statement or brief memory that stands out for you that made such an impact. Perhaps it is a single word that sums it up best. WOW!! You have got to read this. So I walk toward Eddie’s room as I arrive to the hospital and I pause for a moment to talk with the doctor overseeing Eddie's care. I look into Eddie’s room and BOTH EYES ARE OPEN. And he was doing more than just staring into space. He had two visitors already in the room and I think he was looking at them. So I move closer. There was no reaction on his face that I could see. For example, I was looking for a glimpse of a smile – but no; perhaps a tear of joy/relief in his eye – but no; perhaps a squeeze of the hand on command – but not really. But WOW!! BOTH EYES ARE OPEN and for moments at a time. You guys are doing some magical stuff and/or making sure divine intervention plays a part. And as the beneficiary of the donated funds, I will continue to make sure I do my part on my big brother's behalf. Please note, while Eddie is unable to make financial decisions, I am the only one who has access to the funds and I will be withdrawing them in my name. I will be "delivering" the funds to pay any and all of Eddie's medical services/bills/fees/charges. And the moment I see a portion of a smile on his face, or a tear building up in his eye the instant he knows the person in his sight, then I know that Ed is ready to be his own beneficiary.